Cheltenham Festival have renamed the National Hunt Chase in honour of Her Majesty the Queen’s 60 year reign. Now in its 142nd year, the 4 mile NH Chase is one of the oldest races at the Festival run as the opener on the Wednesday. The AJA are also particularly proud that one of our showcase races should be chosen to receive this prestigious title. MIRANDA ROBERTS MAKES IT A WINCANTON HAT TRICK! Congratulations to Wincanton course specialists Miranda Roberts and Chesil Beach Boy trained by Miranda’s father John Coombe who made it a hat trick with a winning ride again today against professionals, having been victorious there also on Boxing Day and on 7th January. To add to the day’s headlines, retired amateur jockey Anthony Knott made news as winning owner for all the wrong reasons, joining Nick Scholfield in the saddle on his return to the winner’s enclosure! This was great entertainment for his many Somerset friends but the stewards handed Anthony a £100 fine for improper conduct. 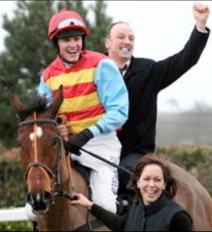 In recognition of the memorable 2010/11 NH season which culminated in Sam Waley-Cohen winning the Cheltenham Gold Cup on Long Run (the first amateur since Jim Wilson and Little Owl 30 years ago) the BHA put aside £30,000 of that season’s amateur prize money won against professionals. Sam Waley-Cohen was asked to determine the distribution of these funds and chose £20,000 to be held by the BHA for investment in amateur races. We are happy to announce that the first of 3 amateur races will take place on 15th February at Kelso. This will be 2 mile 6 furlong HANDICAP CHASE (Class 3) for 5 year olds and upwards rated 0-135 with a total prize fund of £12,000, £6,000 being provided via the BHA from prize money won by amateur jockeys whilst winning against professionals in 2010/11. The remaining 2 races have yet to be announced. Robert Cooper began today negotiating the road from Shropshire to the British Horseracing Authority’s headquarters in London to face the Disciplinary Panel before journeying on to Fontwell races. Having been referred to London by the Stewards at Uttoxeter following his victory on Elton Fox in a maiden hurdle on 31st December, he was given a 52 day ban for excessive use of the whip and for not allowing time for the horse to respond. The New Year’s Eve victory had provided Robert with his first winner in 12 years for his guv’nor John Needham and he went on to ride another winner later that day. In response to his hefty ban, Robert rode his 3rd winner within a fortnight this afternoon to an enthusiastic Fontwell crowd and threw his stick away in defiance as he passed the winning post. Robert said that he was “gutted” with his punishment but “rules are rules and you can’t break them. Obviously some were connecting but not intentionally but they didn’t look at it that way. I know I was way too many over, but it wasn’t intentional.” Robert’s ban will only apply on days when there are amateur races as dictated by current Rules of Racing, but with Hunterchase season fast approaching this will ease the punishment considerably for him. The current whip rules state that the maximum number of whip usage during a race is 7 on the flat and 8 over fences. Each race will be a purebred Arabian Handicap for amateur lady riders, and a different jockey can participate in each race which makes this series very special to our members. Unlike the Fegentri World Championship which currently offers so much to one solitary jockey, this series offers many lady jockeys a thrill of a lifetime riding in exotic and unique places around the globe. Lara Sawaya, Festival Director to HH Sheikh Mansoor Bin Zayed Al Nayhan’s Global Arabian Flat Racing Festival, has organised the series with a prize fund of £20,000 at Newbury (and similar prize levels worldwide), making this the most valuable ladies flat race in the world. Helen Cuthbert has agreed to represent Great Britain in the first race in Oman and Pip Tutty will be representing us in Australia. to re-appoint Dr L A Cotterill as auditors and to authorise the directors to fix their remuneration.